Zainab Irshad Baqri from Amroha, B.Sc Graduate. 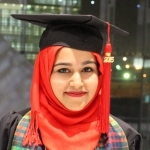 Zainab Irshad Baqri is Equity/Capital Markets Research Analyst and currently have no work experience. VALUATION OF SECURIT.. FINANCIAL STATEMENT .. INVESTMENT & RISK AN.. CORPORATE FINANCE BLOOMBERG THOMSON REUTERS EIKO.. THOMSON REUTERS ZAWY.. ANALYZING INVESTOR R.. SPREADSHEET MODELING.. BUSINESS COMMUNICATI..
are one of expert skill area's of Zainab Irshad Baqri . Zainab Irshad Baqri is working in Finance industry.